How great is it when you have a tube of cookie dough that you’re planning on making cookies with it and you end up eating half of it with a spoon (or your finger)? I mean seriously, who doesn’t love eating raw cookie dough? I don’t know anyone who doesn’t like raw cookie dough…if you find someone who doesn’t like it, they are definitely not to be trusted. I made these cupcakes twice, first for my Boy Cupcake because, well, I’m awesome like that..and a second time for a Labor Day weekend/house warming BBQ we went to. These were definitely a cupcake that Cookie Monster would be proud of. Boy Cupcake described them as “intense” which I’m not sure if it’s good or bad but I’m going to go with good in this situation. I mean, how could a cupcake be bad? It would take a lot of effort to make a bad cupcake. I found inspiration on a few different blogs and sort of went with my own version here to get the effect I was looking for. Since there’s cookie dough filling in these cupcakes, I found a recipe for an eggless cookie dough so that everyone could carelessly eat without fearing salmonella since I’m crazy paranoid about disgusting food bourn illness. 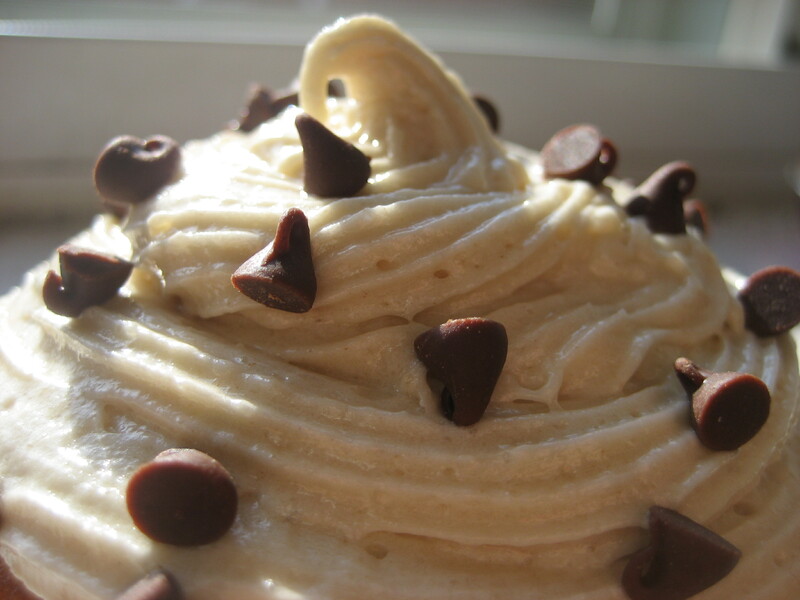 I’ve got to tell you, eggless cookie dough is awesome, everyone should keep this on hand in their fridge for a treat. Preheat oven to 350 and line cupcake tin with 12 paper liners. Beat together butter and sugar until light and fluffy and add in vanilla. Add in eggs one at a time, beating well after each addition, scraping down the bowl as needed. Combine all dry ingredients in a separate bowl, then add in dry ingredients stirring on low speed and alternating with the milk. Divide the batter evenly among the cupcake pan and bake for 20-22 minutes, or until a toothpick comes out clean. Allow to cool completely. In a huge bowl, mix all together and viola! You’ve got your cookie dough stuffing! Cut the inside out of the cooled cupcake and stuff as much cookie dough as you can inside without cracking or breaking the cupcake…it should be even with the top of the cupcake so you don’t even know there was a hole there. Take all of those same ingredients minus the chocolate chips and mix together with a 1/2 cup of heavy cream or milk (I used the milk). Mix in milk a little at a time until frosting is at the desired consistency. 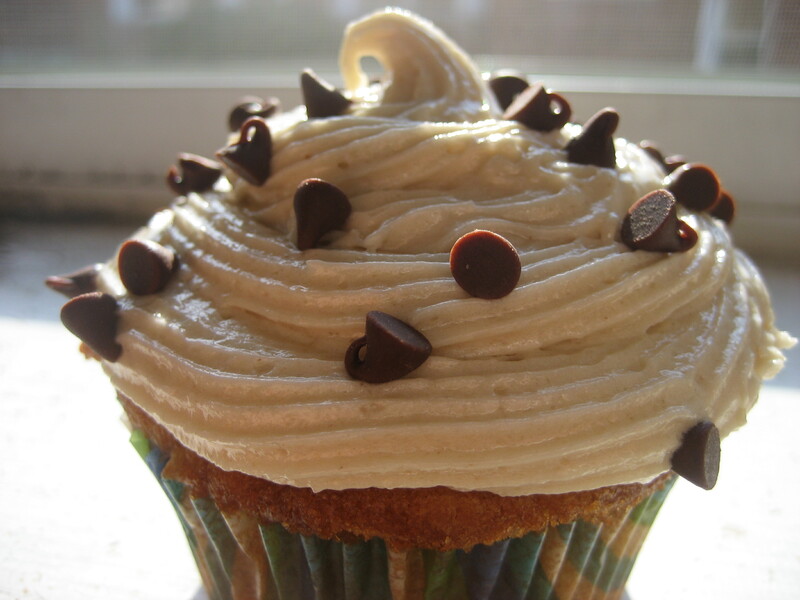 Frost the cupcakes and sprinkle on more mini chocolate chips on top. I’ve got to say, these cupcakes were pretty intense. When you pick them up, they feel like they’ve got to weigh a pound each. I would challenge you to eat more than one at a time because that thing is like eating a cupcake stuffed with two cookies. They were delicious though, when you bite in and get a complete bite of cupcake, cookie dough, and frosting, you definitely realize that all three are a match made in heaven. The cake was fluffy but definitely stood up against the dense cookie dough middle. They were good enough the first time I made them for my Boy Cupcake that I had to make them again for the BBQ and apparently they were a success the second time around too. Yessss! The weather is changing and fall is coming upon us, so that means fall flavored cupcakes! 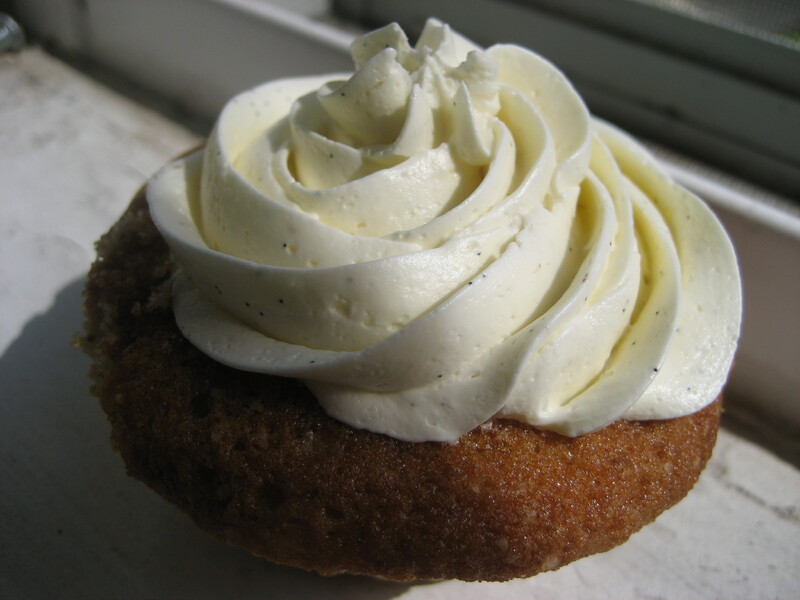 I debated over pumpkin, apple, and wait for it…sweet potato and decided to go with the the pumpkin cupcakes. Super excited to do pumpkin cupcakes with cinnamon cream cheese frosting, I headed to the store to pick up a few ingredients. Well, there was no pumpkin anywhere to be found! So sad! After some research I found out that there’s another pumpkin shortage this year (last year the crop got flooded out) because so many pumpkins were destroyed by Irene. First that biotch ruined my Sunday dinner when we lost electricity and now she’s messing up my cupcakes! 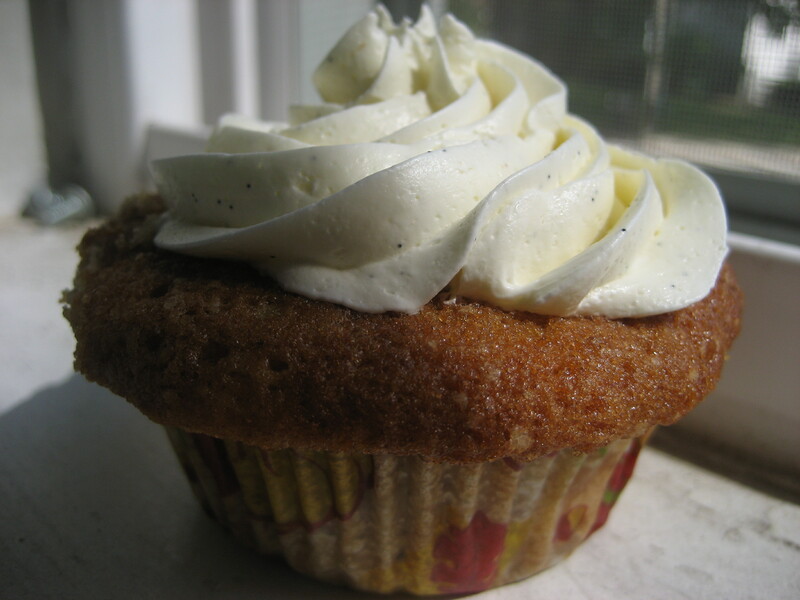 On to plan B…apple cupcakes! Last year it was the caramel apple cupcakes and this year I went with apple pie a la mode. When I was looking for the canned pumpkin, I saw some apple pie filling and decided to just go with it. 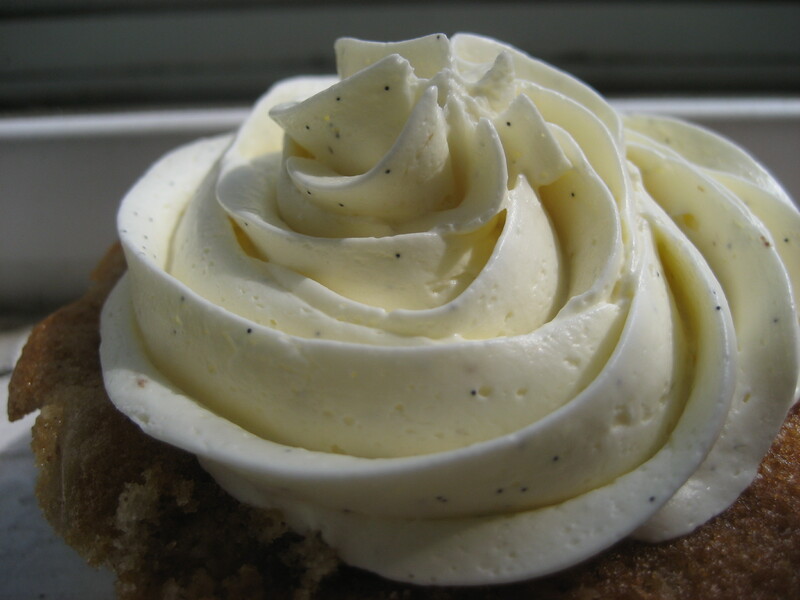 A spiced apple cake with apple pie filling and vanilla bean frosting? Yes please! I looked at tons of recipes to try to put this one together but there wasn’t a great spiced cake recipe to go off of so I pretty much had to work on the fly while I was making them and just make up the recipe. It worked surprisingly well and I’d use it again for the base of another spiced cupcake. I have to admit that I didn’t actually try the finished product but I did try the cake part and it was light, moist, and delicious. 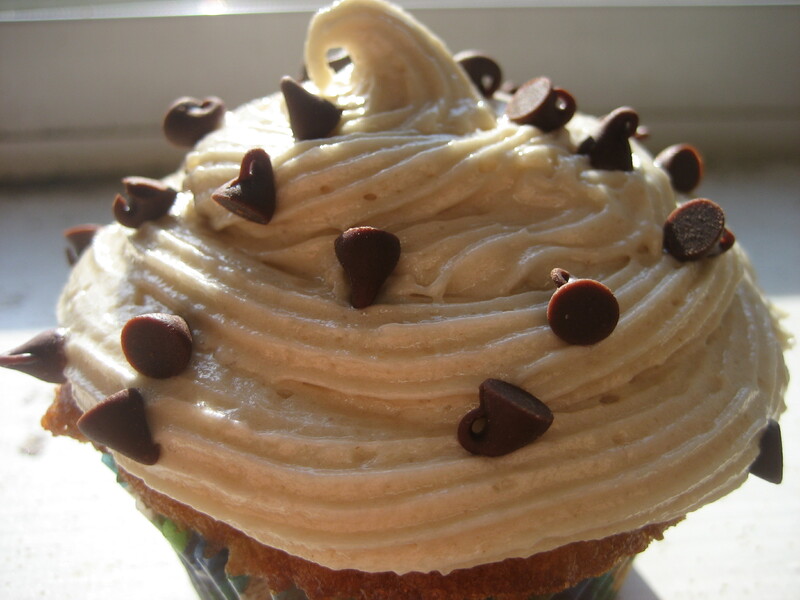 And considering they were topped with my favorite frosting, how bad could they be?? Preheat oven to 350 degrees and line a cupcake tin with 12 liners. Beat butter until smooth and add sugar. Beat until light and fluffy and mix in vanilla extract. Beat in eggs one at a time. In a separate bowl, whisk together all remaining dry ingredients. Add in half of the flour mixture to the butter and sugar mixing until incorporated, then add in half of the water. Mix in remaining flour mixture and then water until just incorporated. Fold in half of the apple pie filling to the batter and fill 12 cupcake liners evenly. Once the cupcakes cooled, I cut out the centers and filled them with the remaining apple pie filling. They were frosted with my favorite swiss meringue buttercream. Even though I didn’t try the final cupcake put together, I’m going to go out a limb and say they were pretty good because well that’s what they tell me and I like to believe it. Plus, the actual cake part that I did try was pretty damn good, so I can only imagine that the whole thing together was good. Plus, my Boy Cupcake stole three from the party I brought them to, so they had to be pretty good I guess.